Science Uncovered is part of European Researchers' Night, and is a free annual festival of science held at various institutions across the UK giving the public the opporunity to discover rare items from the Museum collections, meet experts and take part in interactive science stations, debates and behind-the-scenes tours. This is the fourth Science Uncovered I have attended but the first where I have talked solely about Earthworm Watch and earthworm research. 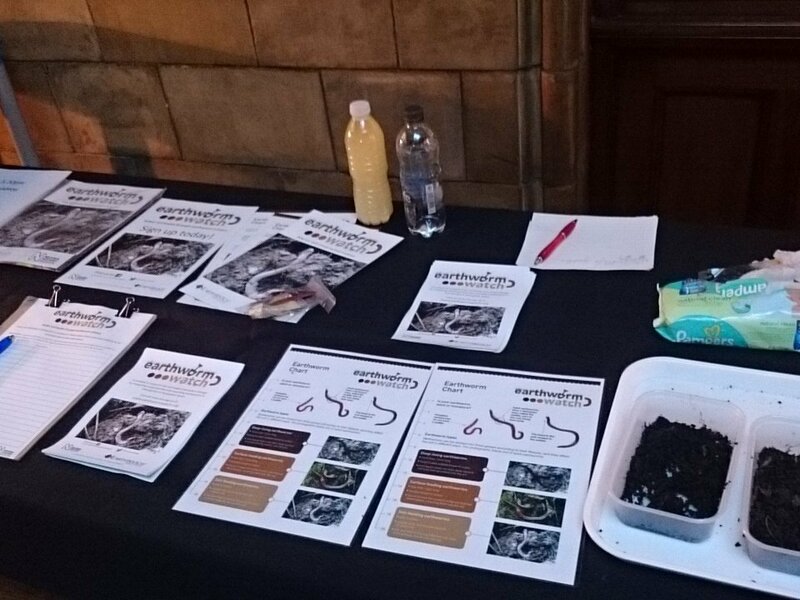 While my colleague Anthony was at Manchester University Museum I was also busy promoting Earthworm Watch at the Natural History Museum, London. I started off in the Wildlife Garden with my supervisor and Earthworm Watch scientist Dr Paul Eggleton digging up earthworms to introduce to the public. Later I moved inside with a display of Earthworm Watch materials, leaflets and live earthworms for the public to 'meet' and answered questions from the public about earthworms. Questions included the classic 'is it true if you cut a worm in half you get two worms? ', 'which end is the head? ', 'how to they mate?' and many more. After a short break for dinner I was off to the 'Science Bar' where the public get to chat to scientists over a drink. This is the first time I had done this activity so was a bit nervous but had an enjoyable time talking to the public about everything from my favourite dinosaur, how we can combat climate change, the wonder of flies and of course, earthworms. Over the whole evening I talked to nearly one hundred people about Earthworm Watch! You can find out more about Science Uncovered on the Natural History Museum website or check what else was happening on the night on Twitter #SU2016.